I heard an online sermon that caused me to ask myself the question: Am I Peter or the disciples? Unfortunately, my answer is that I have been much more like the disciples than Peter. I have been more likely to find myself staying in the boat. As I realize this about myself, it saddens me to know that there have been times when I should have trusted Jesus, as Peter did, but chose to act more like the disciples. When we read this story, we tend to focus on the fact that Peter gave in to his fear and started to sink. The normal reaction to that is, “I don’t want to be like Peter and give in to my fear.” For this blog post, I want to focus on the three things that Peter did right. Got out of the boat– Peter was the only one to get out of the boat. He was the only one who trusted Jesus enough to even attempt to walk on the water. Peter trusted Jesus! We will never know what we can do if we don’t get out of the boat. In the real world, the boat is our comfort zones. If we never trust Jesus enough to venture out of our comfort zones, we will never know what we can accomplish. We will never know how God can use us. Is Jesus telling you to “come”? What is He asking you to do? Is He asking you to get out of the boat? Is He asking you to move out of your comfort zone? Will you trust Jesus enough to obey the command? Focused on Jesus- The passage says that Peter was walking on the water toward Jesus. PETER WALKED ON WATER!!! How did Peter walk on water? Peter focused on Jesus! He looked ahead to where Jesus was. In order to do the impossible he had to keep his eyes on Jesus. As soon as he took his eyes off of Jesus, he started to sink. He turned his focus to his fear and the storm and he started to sink. We can accomplish the impossible if we focus on Jesus. We can accomplish the impossible if we look ahead toward Jesus and not focus on our circumstances. What is that “impossible” thing that you are wanting to accomplish? Are you focusing on Jesus? Or are you focusing on your circumstances? what three things can you do that would help you focus on Jesus more? Cried out for help– Even when his fear got the best of him, Peter still trusted Jesus to save him. Peter still trusted Jesus! Getting out of the boat takes courage. Stepping out of your comfort zone takes courage. Courage is a feeling that comes and goes. Peter denied Jesus three times later on. David ran in fear from King Saul. Do you think Moses was afraid as he faced God speaking to him from a burning bush? Do you think he faced the call on his life with enthusiasm and a willing heart? Moses was afraid. That’s why he came up with excuses not to do God’s will. We ALL feel fear at one time or another. The important thing is to refocus and cry out to the ONE who can save us: JESUS. Have you allowed your focus to slip from Jesus to your circumstances? Have you cried out to Jesus to help you? If not, why? In what three ways can you refocus on Jesus? The main point here is not to let the storms of life keep you in the boat. Don’t let your circumstances keep you locked up in your comfort zone forever. Don’t be like the other disciples who sat in the boat while Peter had this thrilling adventure in faith. He had this AWESOME moment with Jesus that the other disciples missed. Don’t miss that moment because you are afraid or you think that your situation is hopeless. Focus on Jesus. 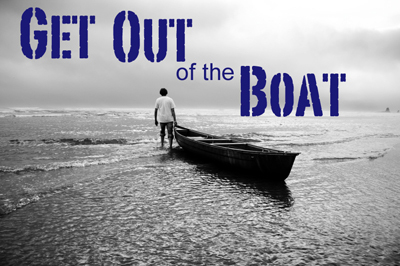 Get out of the boat and see what amazing adventure in faith is waiting for you. Don’t worry if you start to sink. Cry out for help and refocus on Jesus. Trusting Jesus can lead to a wild ride full of impossible things becoming possible. Don’t allow yourself to miss out. Trust Jesus!